All Out Effort Blog: How's Your Relationship With Food? 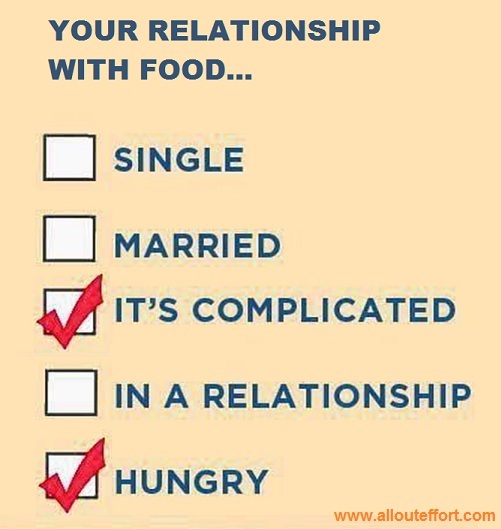 How's Your Relationship With Food? How's your relationship with food? Is it affecting your health? Before any training or diet can help, isn't it time to try and resolve issues you may have with food first? Like anyone in an abusive relationship, they know it's not healthy and they need to get out, but they don't. Is most of our weight and health problems because we don't know the food we are eating is bad for us or our lifestyle is not active enough? Or that we are unaware and have not taken steps in healing our relationship with food, or we fear changing our lifestyle? Because unlike abusive boyfriends or girlfriends, we need food to survive.